By LUDWIG VON KOOPA - And by online gaming I mean online gambling, but there's a lesson there. Once upon a time, I actually wrote on KoopaTV, “we're happy that Jeff Sessions was just confirmed to be President Donald John Trump's Attorney General!” I can't justify that statement, since it's weird even for the early-2017 President Donald John Trump honeymoon period. Maybe it was sarcasm. I want the benefit of the doubt. I never liked Jeff Sessions (aka Attorney General/Senator Jefferson Beauregard Sessions III), believe me. Still don't. Between 2011 and now (thanks President Barack Hussein Obama—non-ironically), the Justice Department saw the Wire Act of 1961 as only applying to sportsbetting as it relates to online wagering, meaning state-regulated online casinos and lottery are just fine. So states like Georgia set up (online) lotteries like the Georgia Lottery, which funds the crucial HOPE Scholarship in that state. People like Rawk get their gambling fix, and kids get scholarships to go to school. Works out for everyone. But now the online Georgia Lottery is considered illegal. Why did the Justice Department suddenly come to this new conclusion? Well, I think I know why. People in the online gambling industry attribute the intense lobbying by (offline) casino magnate Sheldon Gary Adelson and his Coalition to Stop Internet Gambling (which applauded the Department of Justice yesterday) as the reason for the sudden decision. I believe it's actually because of how the gaming industry — the videogame industry, not the gambling industry — treated Jeff Sessions during his Congressional testimony back in 2017. Jeff Sessions was looking for us to look at him posing with his glasses for hours. Instead, we were watching giraffe titans and Captain Goomba. His intention was to defend his honour and integrity, which are deeply important to him as a Southern gentleman. 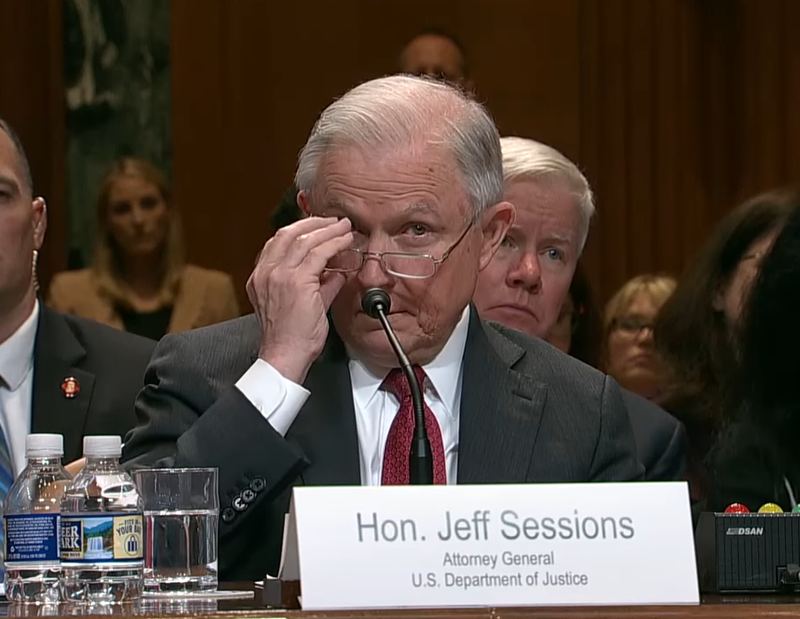 The testimony from Jeff Sessions did absolutely nothing to improve his standing among anyone in the United States, the planet Earth, or the extended universe where us Koopas hang out. He didn't convince anyone of anything. His boss, President Donald John Trump, still wanted to fire the guy and considered him a loser. Angry, Jeff Sessions used his position of power as the Attorney General to go after anything he saw as a threat to people paying attention to him and his attempted defence of his honour. That's why, unlike his predecessor, he went after providers of marijuana and other drugs, because people were using cannabis as an escapism method from his speech. Unlike his predecessor, he supported civil asset forfeiture and mandatory minimum sentences, so people would lose their houses and privacy and go to prison, where they would be a literally captive audience to his testimony and activity. And unlike his predecessor, he went after gaming for the immersive effects (transporting people to worlds other than his speech-making.) Specifically due to this site. But, like the bewildering and strange e-mails that KoopaTV gets in our inbox on a semi-regular basis, Jeff Sessions confused our “gaming commentary” for the gambling industry. Dude ends up going after the wrong industry, since he's an idiot. Hence, President Donald John Trump fired him. Regardless, he got this memo out as one of the last things he did, so now the United States has to live with online gambling being illegal and prosecutable by the feds. Hope the states go and sue. And win. This wasn't supposed to happen with President Donald John Trump as president, by the way. He's supposed to be the casino mogul and be sympathetic to allowing people to live out their vices of choice. Not outlawing them. The kids are fine. Let the adults gamble or play violent videogames. And keep Jeff Sessions away from any power, because that guy ruins everything he touches. Let's knock out that Office of Legal Counsel memorandum via the legislative branch! ...Once they stop their shutdown. Then again, if that keeps up, the Department of Justice won't be in the position to sue anyone. Civil liberties for all! Ludwig is pissed off at the idea of being associated with idiot social conservatives who want to prevent anyone from having fun at their own expense, like online gambling. He has a big grudge against Jeff Sessions, and has been looking for any fans of Mr. Sessions for the past couple of years and hasn't been able to find any. He also put this as a Gaming Commentary article in an ironic sense, just to confuse Mr. Sessions if the Alabamian is reading this article, like Mr. Sessions saw the KoopaTV E3 2017 coverage that was sans-Sessions.